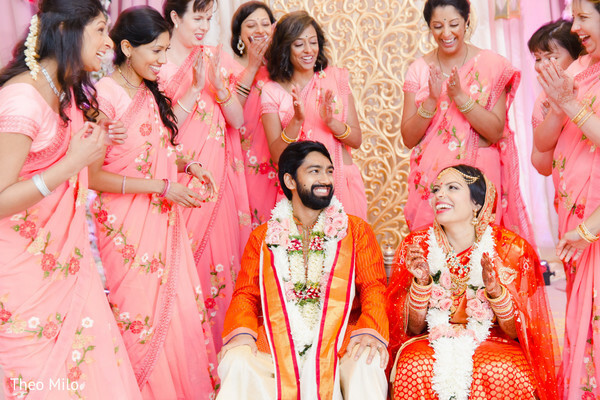 We have come to the last part of the big fat Indian wedding soiree of the lovely Avani and Jay! 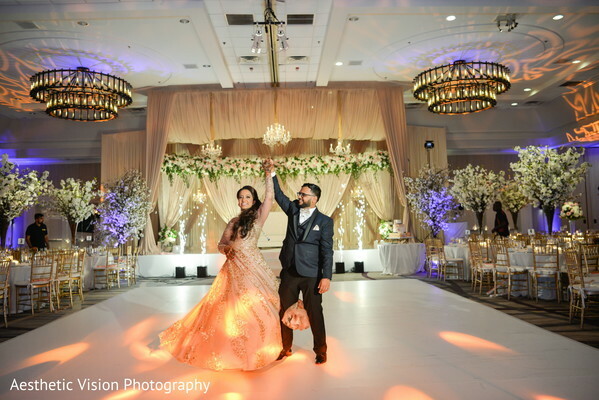 Just right before the spree began at the wonderful Hanover Marriott's ballroom, Aesthetic Vision invited over our sweethearts to pose for a round of beautiful portraits surrounded by their splendid wedding scenery! 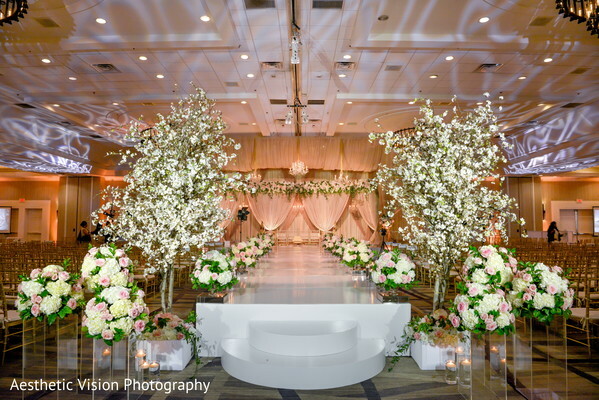 This magnificent wedding stage set up was an ingenious creation of the celebrated Elegant Affairs Inc. who transformed the ceremony space into the reception stage and kept the opulent ceremony theme with the amazing white blossom trees that were perfectly placed on each table to give each a touch of fresh air and luxe to the reception space. 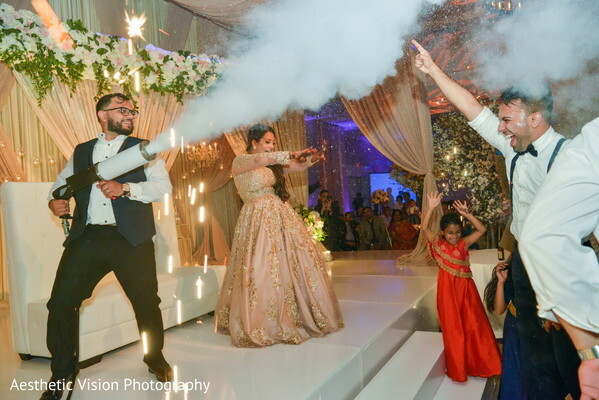 C&C Events provided the creative uplighting and a great laser show, and MVP DJs completed the celebratory ambiance with the best Bollywood sounds and two great CO2 cannons for the newlyweds to play! 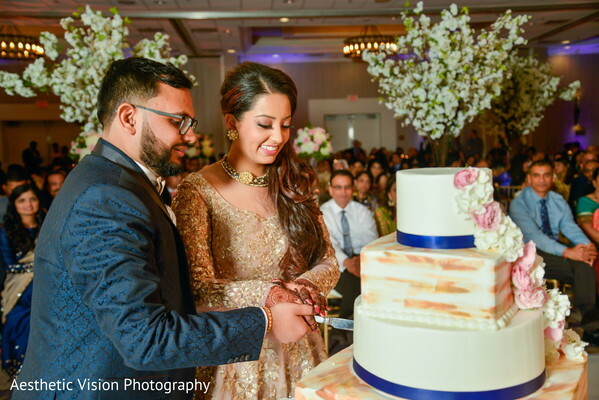 Meanwhile, Rasoi's food was one of the guests' favorite parts; in the bride's own words: "They all loved the food provided by Rasoi!". 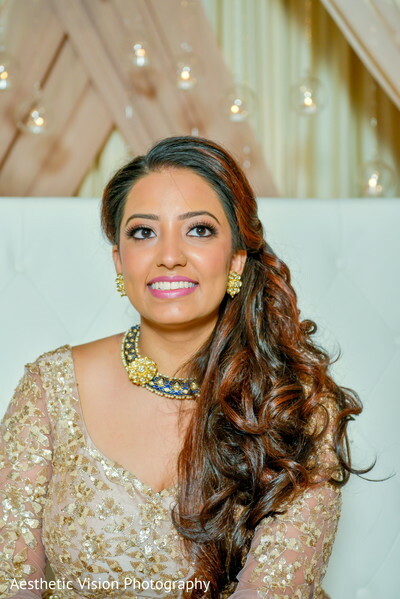 What an amazing look Style by Susmita gave to Avani for her final appearance, as she wore a splendid cream color design she fused with some loose sleek curls and glowing makeup! 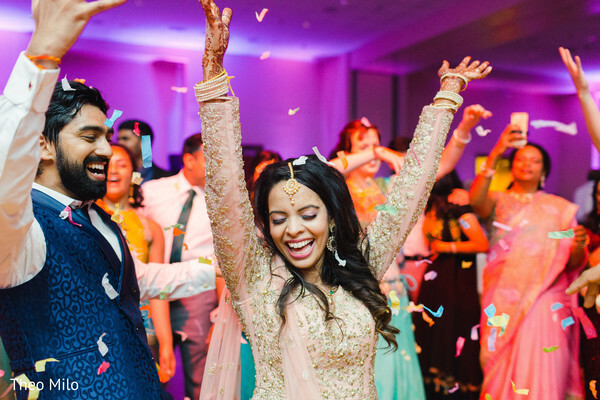 Take a closer look at the blushing bride and all that included celebrations in our full gallery! Jay proposed on our 6 year anniversary, 4/21/2017. He planned an entire day full of surprises! He involved my managers and work and planned on getting me out of work early. He sent a limo to pick me up and had flowers and a letter waiting for me. He had the limo drive us to our first date spot, Acquista Trattoria, in Queens, NY. My two best friends were waiting for me there with my second clue! He then had the limo drive us to our college campus, where we met! He had my cousin waiting there for me with different outfits and shoes to choose from. We quickly got ready and hit the road again! We drove through the city, stopping off at Pellegrino's Italian Restaurant in Little Italy, where we celebrated our first Valentine's Day. We picked up a few more of my cousins who had the final clue! The limo drove us to my dream proposal, right under the Brooklyn Bridge! As I got out of the limo, my heart was racing, knowing the man of my dreams was waiting for me. I started walking towards him, with the biggest smile on my face. He had the cutest little picnic set up, with some champagne, cheese, and crackers, and chocolate covered strawberries. He had pictures of us set up with wooden blocks of our initials. It was the sweetest little setup! He sat me down, and asked how my day was (knowing exactly how it was since he planned the whole thing!) He soon got into talking about a lot of things I don't really remember because I was just SO excited! 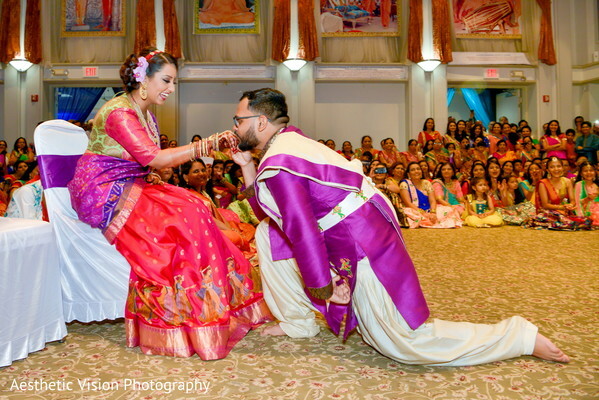 What I do remember are his last words, "Avani, will you marry me?" as he was holding the most beautiful ring ever! I said the quickest YES of my life and gave him the biggest hug and kiss! Before I know it, all of our siblings, cousins, and closest friends came running out and surprised me! We took some pictures, and later met up with our parents for dinner. After dinner, Jay had rented out an Airbnb which was full of ALL of our friends and family! We celebrated all night and had the best time! At the end of it all, I was FINALLY engaged to the man of my dreams, and it was the proposal I had always wanted! For as long as I can remember, I always saved pictures of different outfits for whenever I got married. 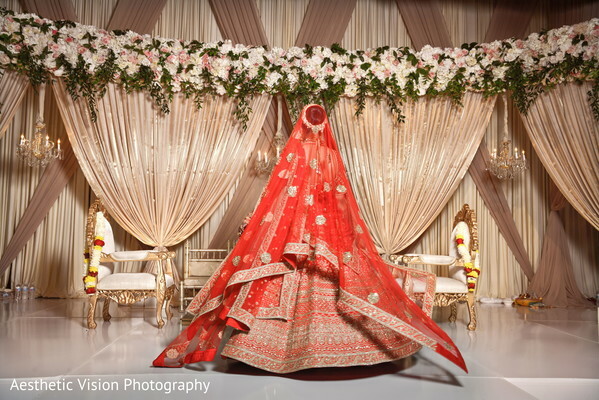 I knew I wanted to be a traditional bride, wearing lots of red. When I went shopping for my lengha, we went straight to Sabyasachi, in Mumbai. I fell in love with everything. As I tried different lenghas on, I felt my self drawing back to the first one I had tried! It was a beautiful shade of red, with very detailed work. 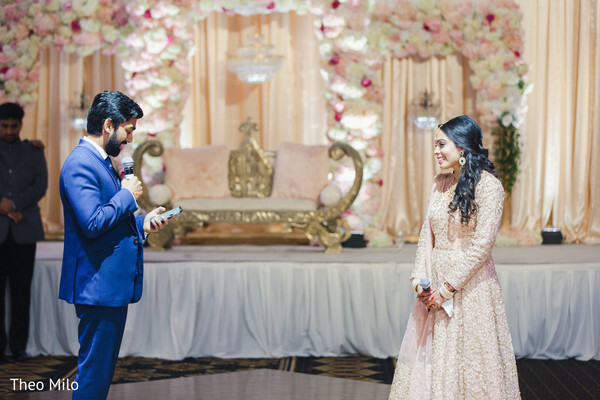 The skirt had intricate blush flowers on it and it came with 2 different dupatta options: red or blush pink. I thought I wanted two different dupattas, one red and one blush, but when I was trying them on the all red look just swept me off my feet! I couldn't stop staring at the lengha. 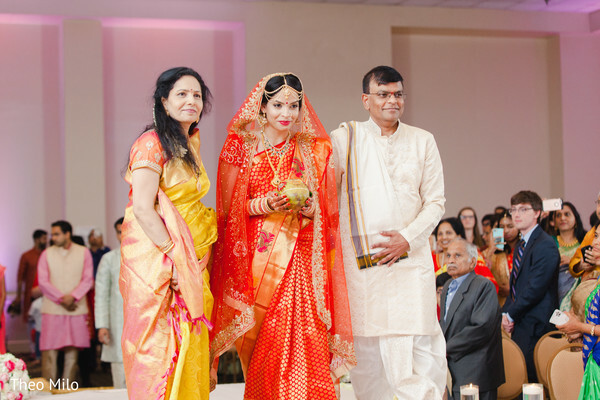 It was the first place we had gone, so my mom and I decided that we would look around and see what else there was and then come back if we didn't find anything that made me feel as good as that lengha did. Every shop I went into after that, I kept comparing it to the Sabyasachi lengha. I knew after 2 shops that my heart and mind were with the first one. 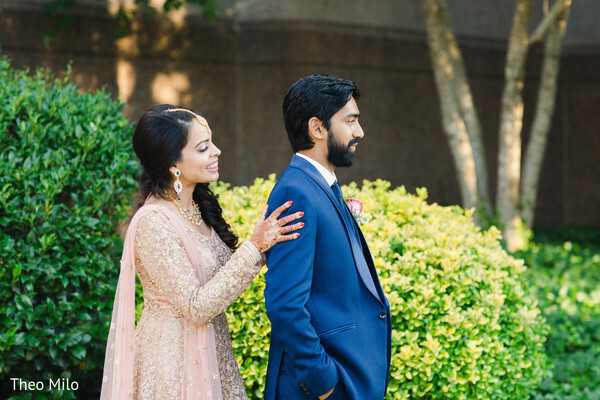 A few days later we made our way back to Sabyasachi and said YES to the lengha! 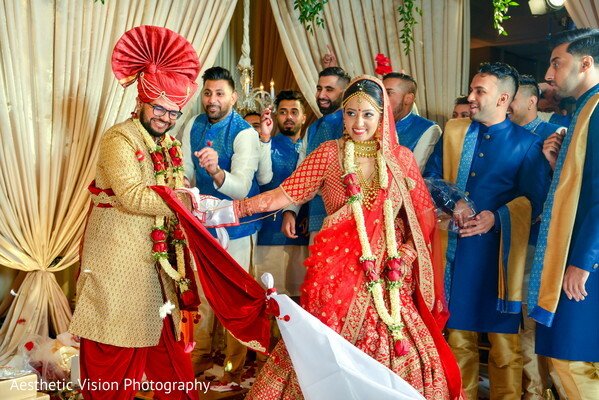 It was the most beautiful lengha! I couldn't have found something more perfect for me! My favorite parts of wedding planning we definitely picking out our menu and decor. AND WEDDING SHOPPING!I loved trying so many different foods! Rasoi was the best! We had a strictly no onion, no garlic menu and they catered to our every need! The food at the food tasting was phenomenal, and the exact same food is what our guest ate during all the wedding events! I also loved picking out our decor. 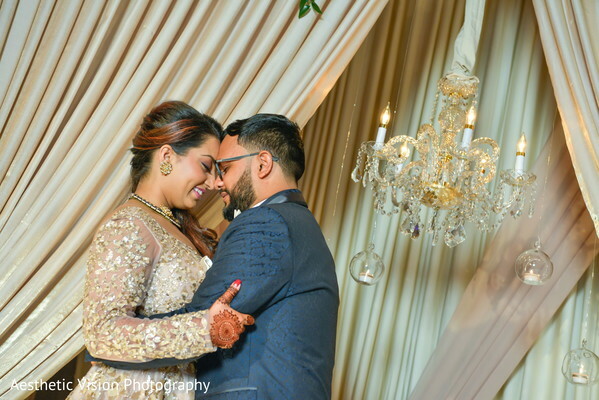 Sharda at Elegant Affairs showed up the most magical mandap and we fell in love. 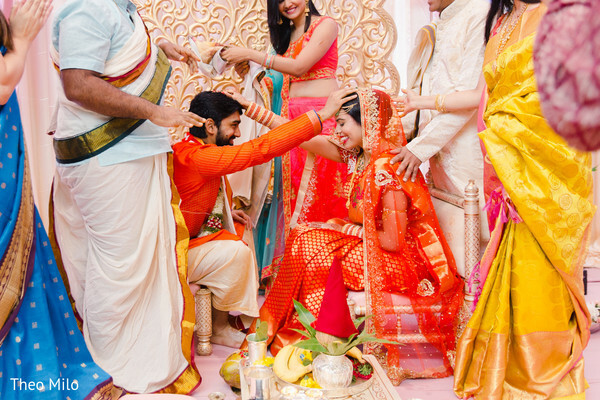 I had saved so many pictures of what I thought I wanted but she showed us so many more pictures and we created the perfect mandap for us to take our pheras in! 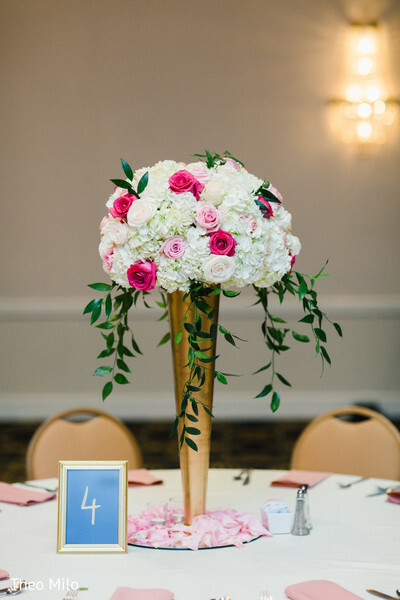 And the centerpieces she chose for us, blew our minds away! 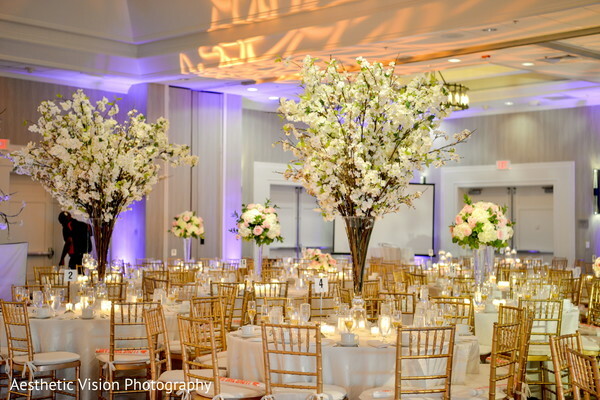 Beautiful cherry blossoms trees, Florals pieces, and candles and petals! 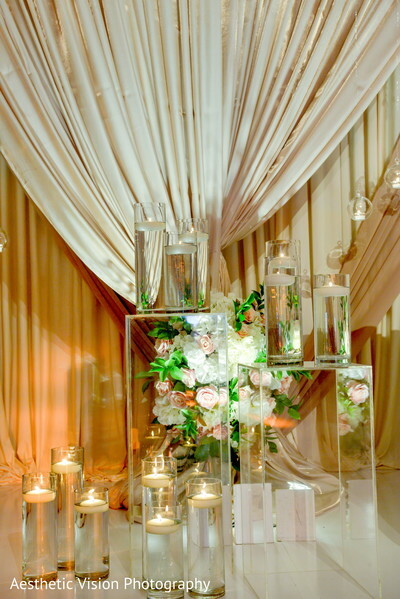 She tied all the tables together by incorporating florals and candles. It was stunning! But how could I forget the wedding shopping! Getting dolled up every day and trying on new outfits and jewelry was SO MUCH FUN! It gets a little stressful at times but overall the whole experience was so great! 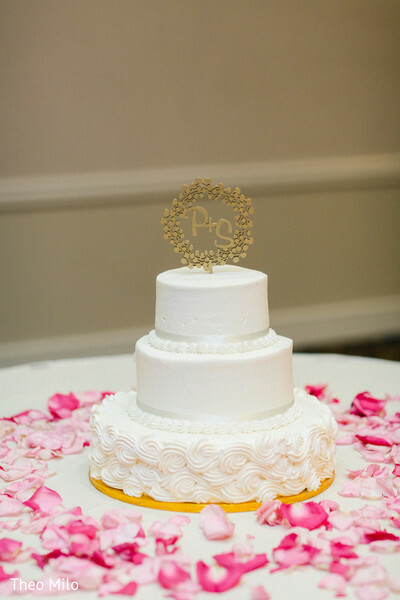 Aside from watching Jay and I get married and celebrating with us, our guest loved three things in particular! 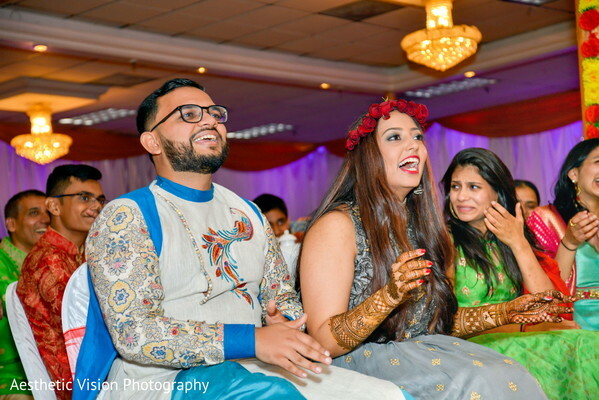 1) they all loved the food provided by Rasoi! They had so much fun during cocktail hours since we had so many different stations up! 2) they loved the organization and execution! We got SO MANY compliments on how smoothly a 1000 person wedding went! and we have none other than Tum Hi Ho Events to thank for that! They really put their all into our wedding day and it couldn't have gone better! 3) music!! MVPDJs absolutely ROCKED the night. Jay only had one request during wedding planning and that was to have a concert at our reception! and MVPDJs, especially JRK definitely delivered on that request! They provided us with CO2 cannons and amazing music! 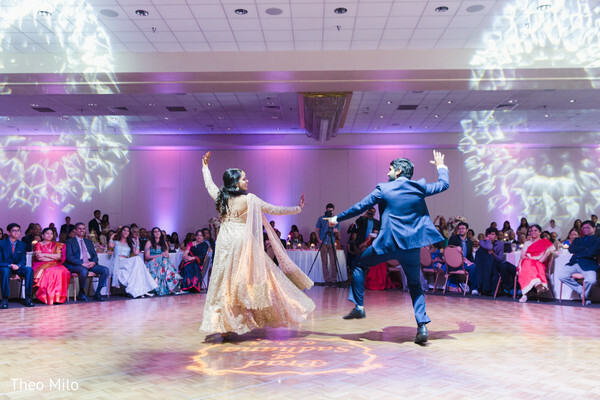 the crowd was on the dance floor till past midnight, and so many of them forgot about dinner because they couldn't get themselves off the dance floor! Our lighting company also provided us with a laser show, so my husband's dream of a concert at our reception definitely came true! 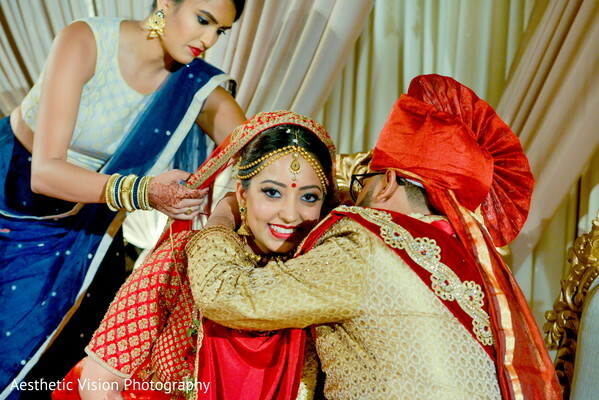 My words of wisdom for Brides-to-be would be to just enjoy the process, and take it all in! It's the same advice other brides gave me, and it was the best advice! I miss every bit of wedding planning and the wedding week and I would do anything to go back! It passes by in the blink of an eye, so don't stress the little things as the big day comes closer. Just enjoy it, have so much fun, and remember what it's really about, marrying the love of your life and starting the most beautiful journey together. 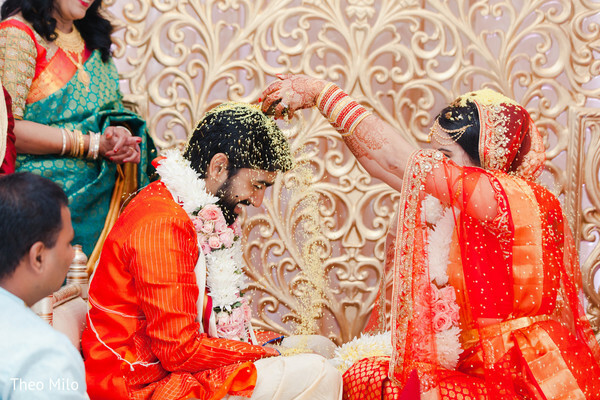 Let me know what inspired you about this grand Indian wedding in the comments below and remember to join me in tomorrow! 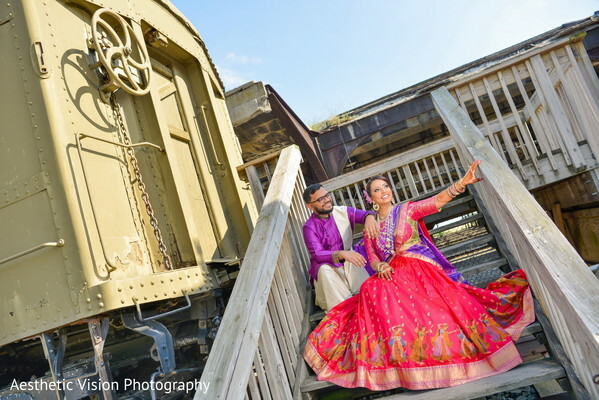 Elegant Affairs Inc., Tum Hi Ho Events and Studio Nine Photography + Cinema are members of the Platinum Guide. Love what you see? Explore their portfolios. 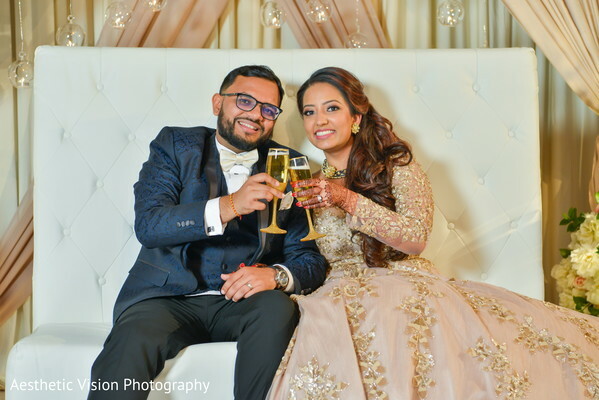 We keep on following the lovely Avani and Jay through their wedding days and now it's time to showcase all the beauty and elegance that the genius creatives from Elegant Affairs Inc. produced for the lavish ceremony! 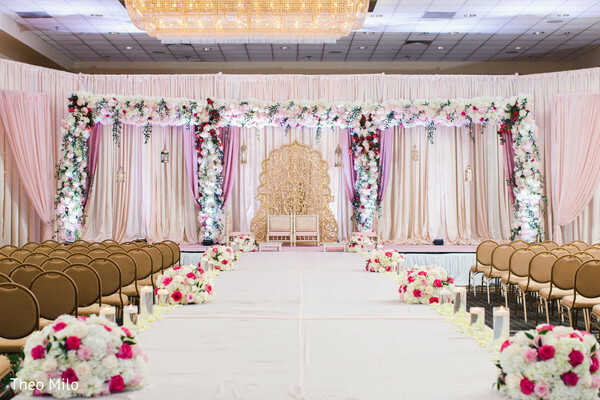 The fantastic Hanover Marriott was decked perfectly with white blossom trees and a stunning open draped mandap in a beautiful beige palette, while a pop of pink colors highlighted the charming floral arrays! 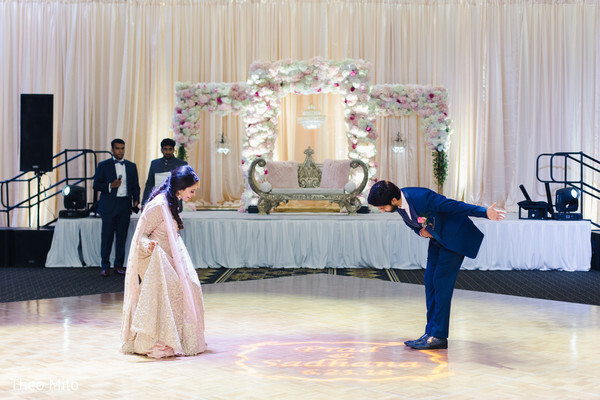 Tum Hi Ho Events organized this 1,000 guests wedding event flawlessly and guaranteed that every detail ran smoothly during the meaningful rituals. Wrapped in red, Maharani Avani flaunted a magnificent Sabyasachi design while a dazzling dupatta finished off the ensemble just right! 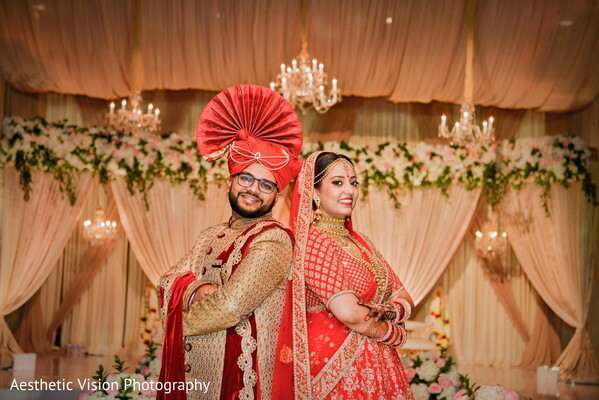 Style by Susmita gave our bride an astonishing makeup and a heavy golden bridal jewelry set gave her an extra glow as she exchanged vows with the Raja of her dreams, whom also opted for a regal sherwani design and a superb turban! 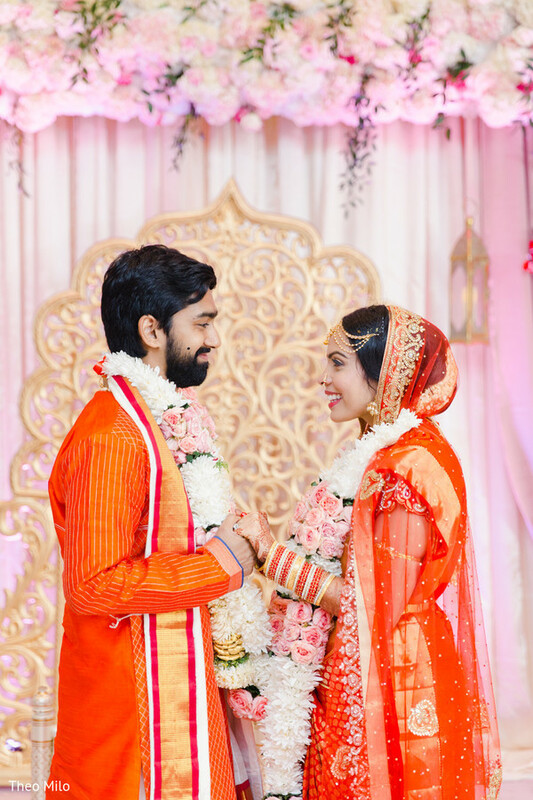 See more portraits of this sweet pair during their wedding solemnity in our complete gallery by Aesthetic Vision! The reception is coming right up! 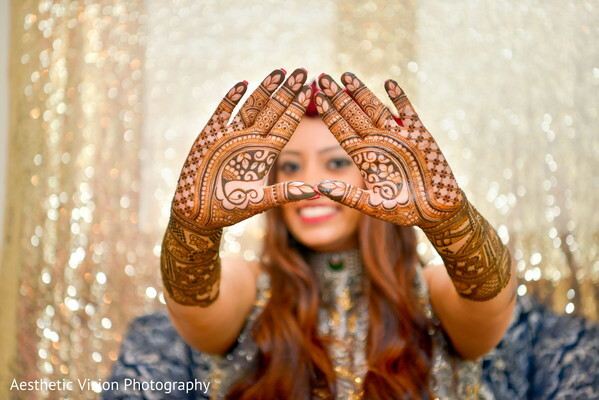 I have the pleasure of introducing an absolute vision of love thanks to the amazing images shared by Aesthetic Vision! 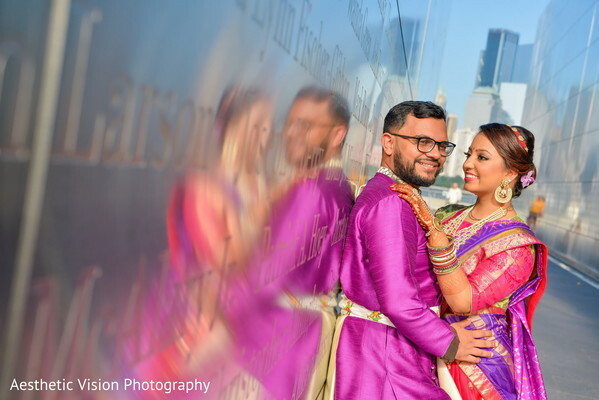 Avani and Jay are today's lucky couple who celebrated their union having a series of big days. 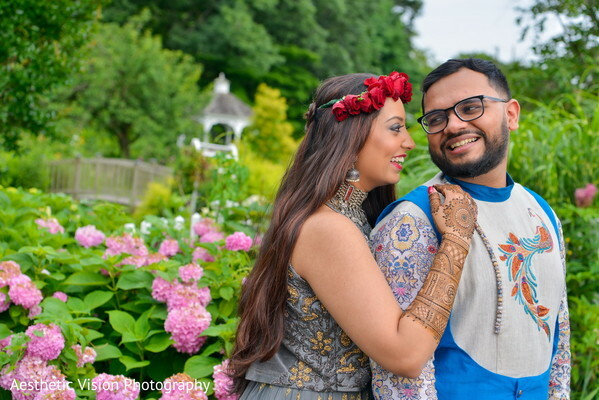 The celebrated wedding expert Tum Hi Ho Events planned and brought to life the events before they exchanged vows which are all narrated through the fabulous images we are about to unveil! 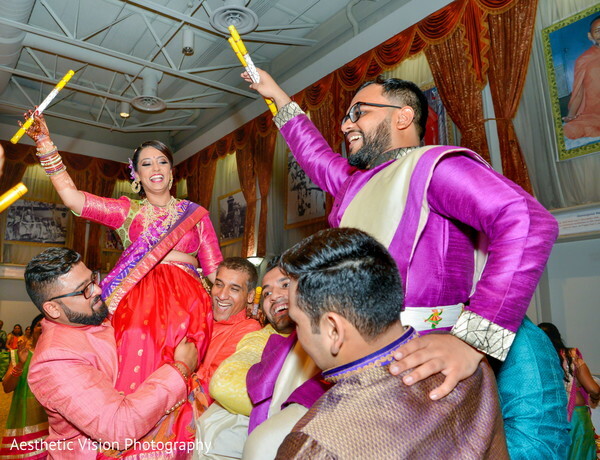 An auspicious mehndi ceremony decorated the arms of our lovely bride and was followed by a joyous and well-attended Garba night. 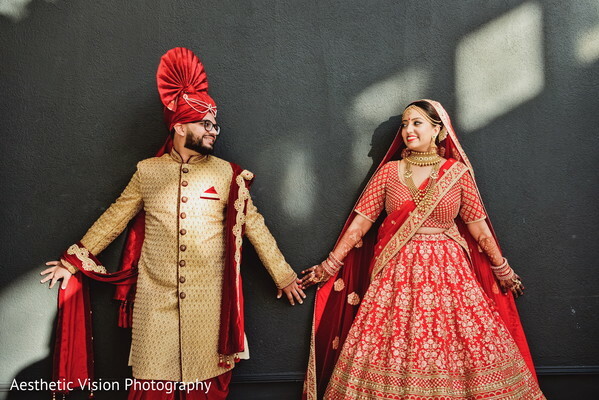 I particularly love the couple's bright and vivid outfits that were perfect to stand out among the crowd. 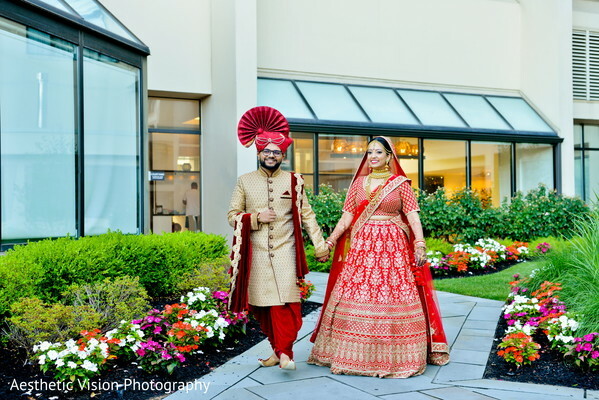 Maharani Avani's ruby color lehenga skirt featured beautiful dandiya dancers and her floral low bun created by Style by Susmita was perfect for a revelry event while Jay's super-stylish and traditional outfit truly made a statement! 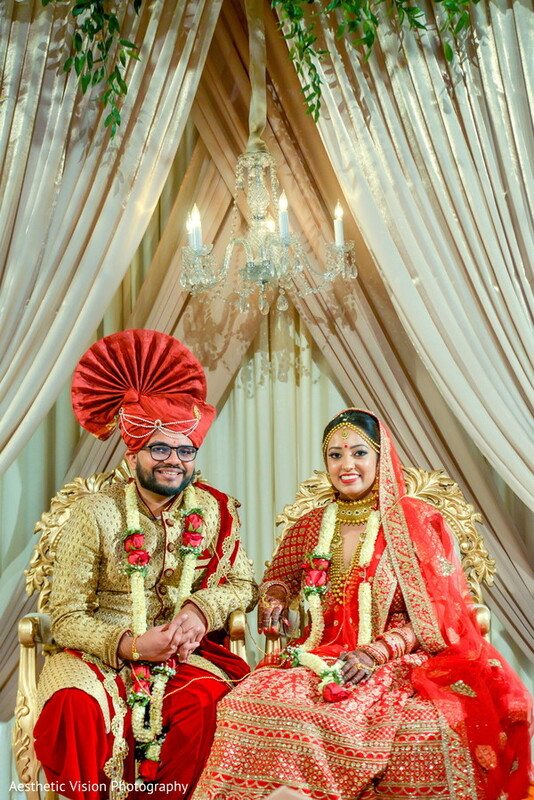 Peruse our Video Blog and watch the fascinating highlight video created by the genius filmmakers of Studio Nine Photography + Cinema and head to the gallery for more fabulous pin-worthy ideas! Don't go too far, you are going to love the portraits we have coming up next! 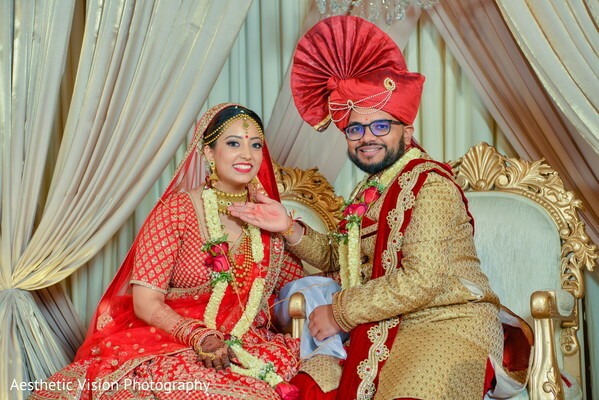 We break down everything about the splendid wedding celebration of Sadhana and Prad in our third and final feature dedicated to this cute soulmates! 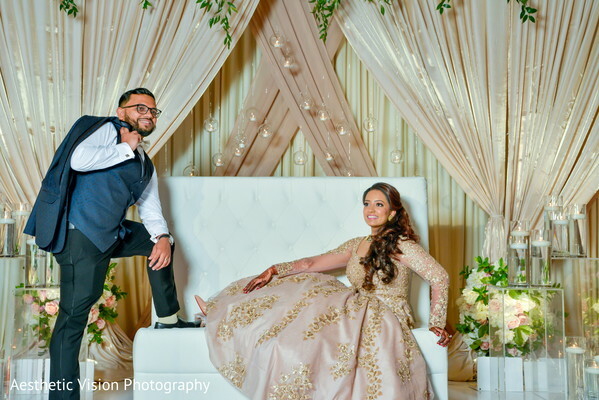 Theo Milo Photography shot the new Mr. and Mrs. in a sweet first look photo-shoot that revealed the extraordinary style that our stellar couple flaunted for their last big event! 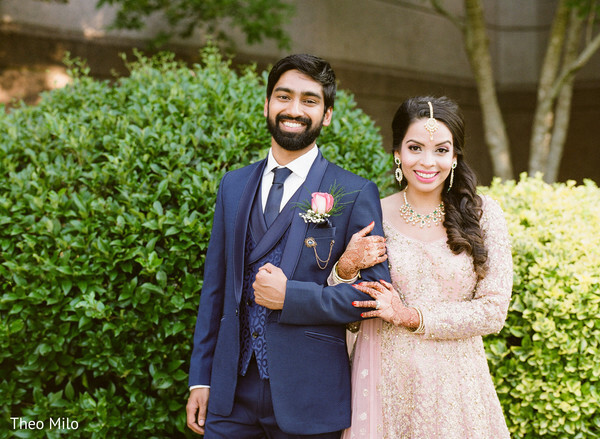 Prad in a three-piece navy suit, looked picture perfect while Zamarial Allure Studios ZAS provided our beautiful bride Sadhana with a fresh, rosy and radiant makeup look! 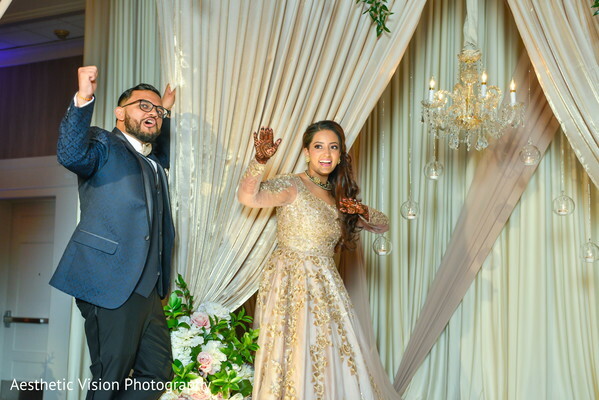 Her blush pink Anarkali suit embellished with heavy glitter embroidery dragged all the eyes on her and made a real fashion statement on her reception night! DJ Ran, DJ Sandeep, and DJ Kadani were the masterminds entertainers behind the turntables that made everyone danced while Taaza - Udipi Cafe served a traditional feast that made their evening extra special. 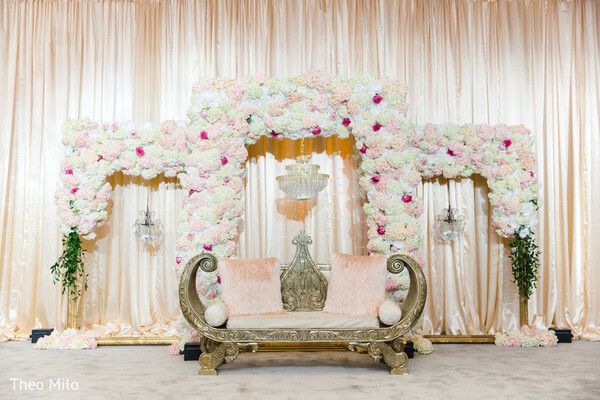 This time the creatives from Katen Shah Designs gave Sadhana and Prad a glorious ambiance for their soiree, creating a trio of amazing floral arches in pink and white hues that matched the graceful centerpieces that decorated each table! 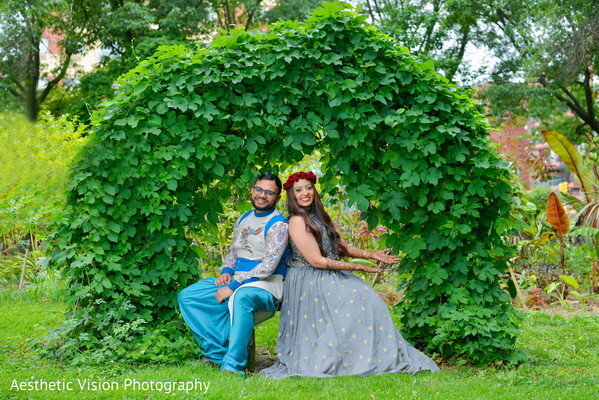 See all the magic that surrounded today's lovestruck couple in our complete gallery! Thanks for joining in! See you next time! I am so happy to be back with all the details of Sadhana and Prad! 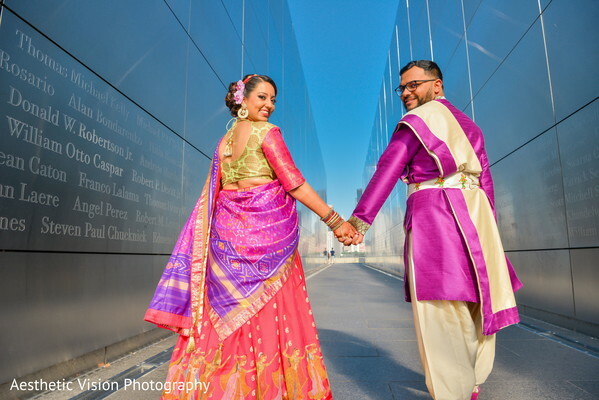 The beautiful couple we met in our previous post now headed to the grand Hindu Society of North Carolina to be wed in a grand Hindu ceremony! 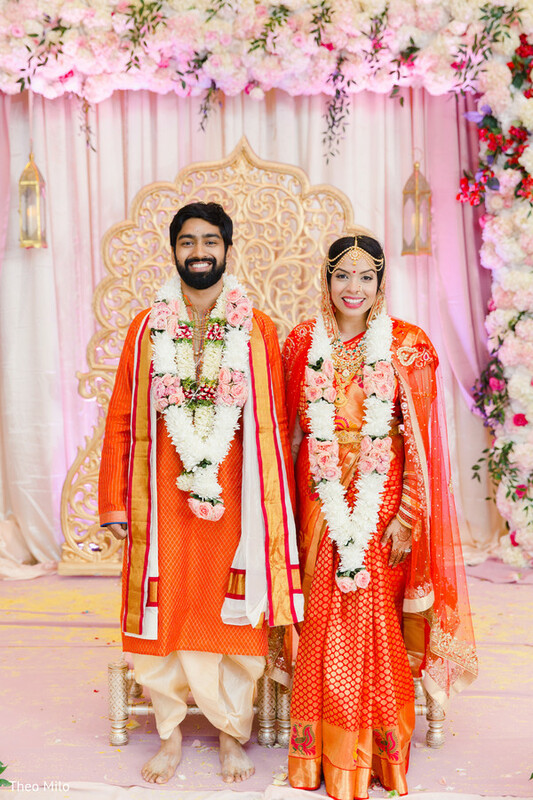 Katen Shah Designs framed the solemn moment with a divine triple floral arch, while a splendid golden carved structure stood behind the lovely bride and groom! 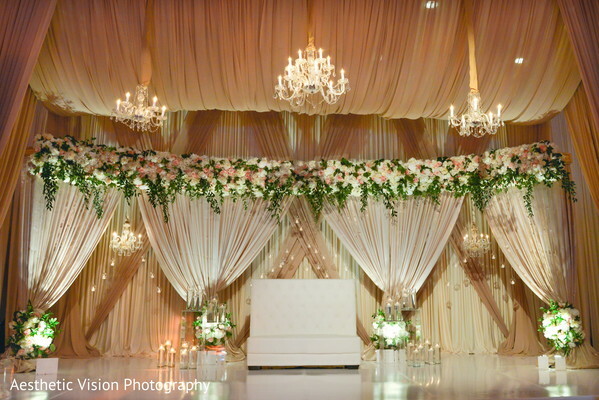 The aisle was equally ravishing with a long line of the cutest floral arrays that decorated the lovely bridal entrance. 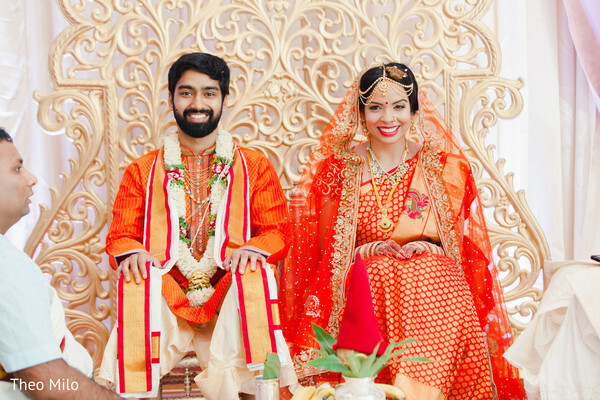 To say "I do", the beautiful Sadhana went for a traditional South Indian wedding trousseau in a vibrant orange and dazzling golden color, while an exquisite jewelry selection really made the look unique. 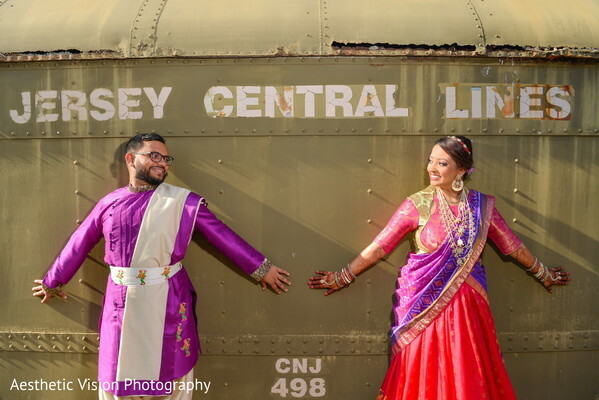 Her prince charming, Prad's attire resembled the bridal hues and a sweet bridal party joined the newlyweds in superb rosy sarees! 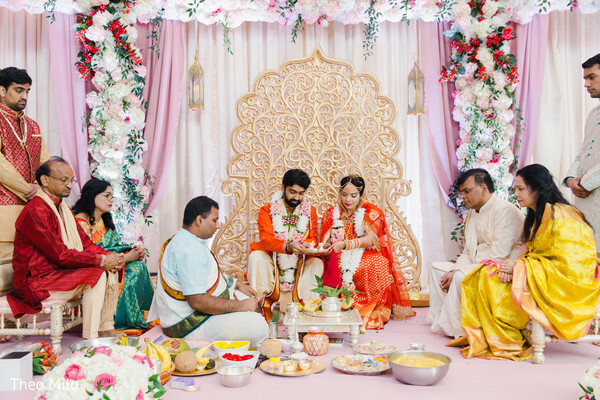 Check the beautiful ceremonies and sacred rituals that joined Sadhana and Prad's lives in our complete gallery by the talented Theo Milo Photography! Stay tuned ladies, the glam bash is just around the corner!